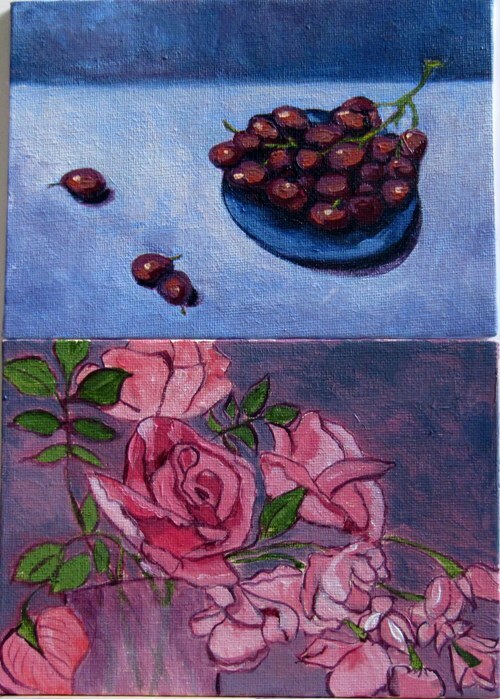 The painting of the grapes are from another lesson from Painting Still Lifes and the bottom painting is from the leftover paint from the lesson and is not quite finished. 1) The reference photo for the painting is too small and therefore it makes trying to draw from the photo really difficult. The photo is thumbnail sized. There was no way I could make an accurate sketch of those grapes. 2) The photos on where to place the paint are too small – again thumbnail sized. There are some pictures that are about half a page, but they tend to be mostly of the finished painting or of some detail. This is not great when you need glasses to read. I usually end up printing an A4 sized picture and load up my photo full screen on the computer when working from photos I have taken. 3) The colors for the color mixing are too dark in the book. I think this could be a printing issue. I am using Artist’s quality pigments, in the appropriate amounts, and they come out completely different from the chart in the lesson. In this case, it seemed to have worked out ok. I fast forwarded through the book and there are some larger pictures towards the back of the book. If you were a beginner trying to use this book, I would be really frustrated doing the lessons in the beginning as I would think I was doing something wrong with the color mixing. It is really difficult to see the differences in value in the book sometimes. 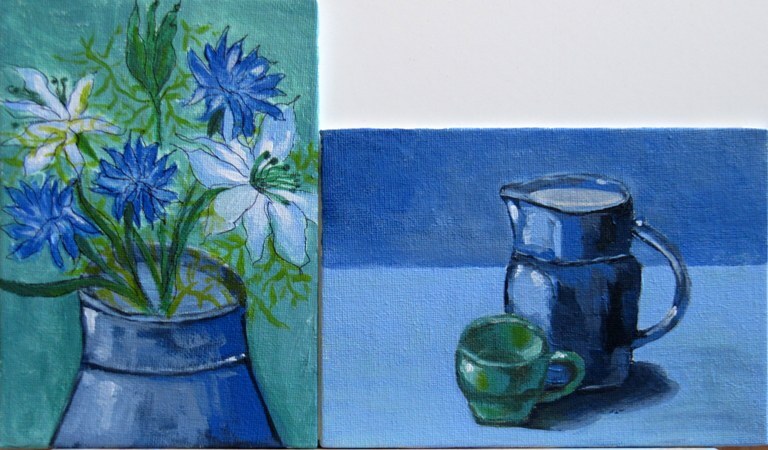 I have used up the last of my my 5 x 7″ canvas boards. It is interesting working small and for some reason it takes me twice as long to paint! I am still having issues with my backgrounds as I am still uncertain on how to place the paint and so I end up doing a lot of glazing. I bought another Art Book. The book is called: The Art School Approach – Still Lifes & Florals by Vanessa Rothe. The lesson I worked on was Pitcher & Cup and my result is on the right. The author recommend working on a larger canvas – 9 x 12″, but I decided to use up some small canvas boards I had handy. The method taught is different from my other book, Painting for the Complete and Utter Beginner by Claire Watson Garcia. However, there are some minor similarities. If I have any issues with the lesson I did today, it is that the illustrations for the instructions for this lesson was not entirely clear, to me. Fortunately, I have watched enough videos to work out how and where to place the paint. The darks were too similar to see where they were to go but I think I managed the spirit of the lesson. The downside to this lesson is that I had to work out my own background as it did not offer one. I just jumped forward to the next lesson to work out how to do it and carried on using the existing colors of the painting. As I had plenty of paint left over I decided to use the same colors to create a still life with flowers. I have a vase in my hallway with some lovely silk flowers and decided to use them for my painting. I had faux cornflowers and scabious that I put into a little blue jug. I modified my jug into a vase and loosely drew the flowers. I can see now that I really need to work on my elipses before starting to paint! When the painting was finished, I used a fine Sharpie to outline the flowers to tie it into the vase. It isn’t perfect, but I am happy with the result. I went small. As the canvas board is small, I did my initial drawing on a piece of paper the same size. I then used charcoal on the back of the drawing and traced it out onto canvas board instead of drawing again straight onto the board. I also previously tinted the board yellow using leftover paint from another painting. (Leftover paint is great for making colored grounds.) The tracing technique is from the Utter Beginner book and can also be done from photographs if you are not happy with your drawing skills. As far as I am concerned, it is the painting that matters and even the greats did it, although purists might disagree with this method. Also, I did not have the green recommended in the book and had to make one up. I think it is close and in making up this green I discovered I can make a really nice turquoise. I also added a background as there is none to add in this lesson. I have issues with backgrounds and am pleased how this turned out. As I hate wasting good paint, especially Artist’s Acrylic, I had to think of something quickly to make. Needless to say, I had more fun painting the flowers and they turned out better than I expected. Using the methods from the first lesson, I loosely painted the vase and flowers onto a previously colored canvas board (light green). Although there is no substitute from learning from actual people, sometimes a book or a video can be of great help, especially if you can’t get to a class.